It has been one year since we had taken any trips of note and hence it has been an year since this site was last updated. We had been busy settling down in India after moving our residence to here from the US - well, mostly getting over the shock of actually leaving well manicured Irvine, California to a completely haphazard Pune. With time one can learn to live with any handicap, including the seemingly impossible one of adjusting to a life without Target, Starbucks or Panera Bread. Once we figured out that there is a life after latte, we decided to unpack our travel life as well. We decided to start our India exploration from New Delhi as we always start from the capital city when exploring a new country and also for a minor fact that it was the only city where we could fly to without burning through our savings (or what is left of it). We decided to spend a week there and like any world capital, a week is what you need to at least scratch the surface. We spent all of those nights in a B&B (Devna) at Sunder Nagar as that seemed like a central location for the sights we want to visit and that is where our guidebook asked us to stay. The closest of the "sights", Purana Qila (Old Fort) was walkable from Sunder Nagar and that is where we headed on our first afternoon in New Delhi. It is believed to be the site of the legendary city of Indraprasta (although there is no shred of evidence to support this). The most of the fort was built by Sher Shah Suri in 16th century and the most interesting structure inside the fort is his mosque which is in a reasonably sound condition. The following day was Holi - which for the uninitiated is a festival invented to leave the tourist hungry and dirty. Everything shuts down which means all restaurants, shops selling fruits and biscuits and more importantly all laundromats. The locals, in order to drive the point home, will throw colours on the tourist which cannot be washed off as one cannot buy soap or the services of a dhobi (laundry) wallah. Well, *everything* doesn't shut down. The monuments and the museums remain open to entice the tourists to come out of the comforts of their dwellings. Gullibility is not something we lack and left the confines of our B&B bright and early armed with power bars and cookies to take on the colour spitting world. Our first stop was Humayun's Tomb and we had the monument all to ourselves except for a bus load of Japanese tourists who have now mastered the art of blending with the surroundings and making themselves practically un-noticeable. 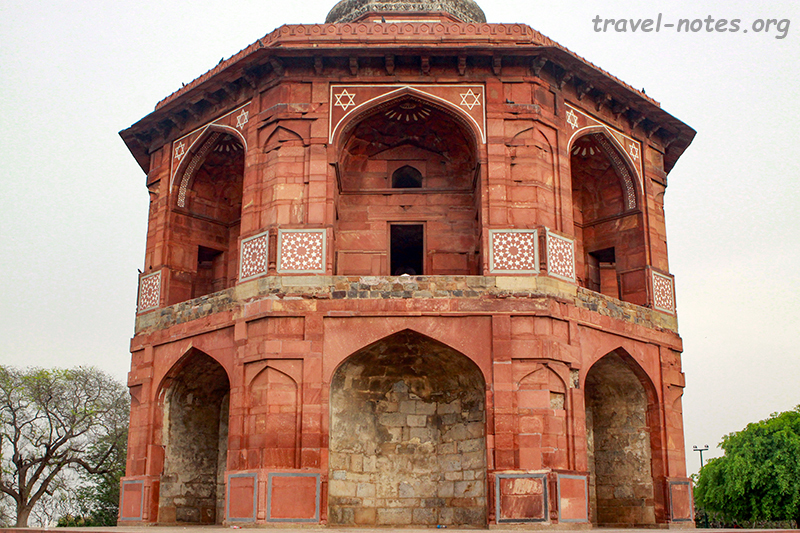 The mausoleum was built for the second Mughal emperor by his chief Persian wife, Haji Begum. It is not hard to convince yourself that with a bit of a whitewash and a couple of minarets, it can pass on as the Taj Mahal. Our next stop was the cloyingly lavish Akshardam. The 20,000+ carved deities is sure to overwhelm your visual senses. 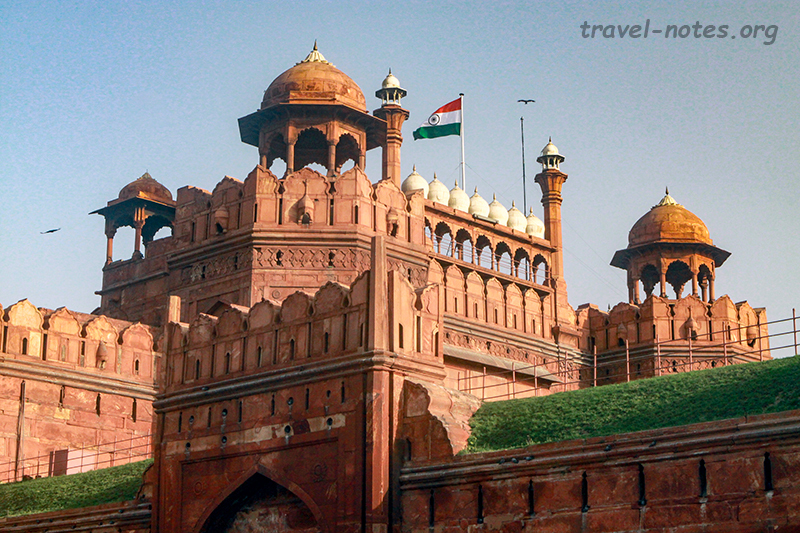 In the late evening (after giving our son an opportunity to catch his obligatory afternoon nap), we went to the Red Fort. A Rs. 80 auto ride brought us to the sight that remained just a dream to hundreds of freedom fighters - to see the tricolour flutter over the famous Lahore Gate. The fort was built by Shah Jahan to house his new capital Shahjahanabad and that dream also remained unfulfilled as his son imprisoned him for bleeding the treasury dry in order to build a certain white marble building in Agra. The Diwan-E-Am (Hall of Public Audiences) and the more lavish Diwan-E-Khas (Hall of Private Audiences) are the top two attractions inside the fort, now that everyone has given up looking for that Peacock Throne that used to lie hereabouts some 250 years ago. Holi-Sunday was followed by its opposite, a day when everything but the monuments remain open. We started off in Lodi Gardens, India's answer to the Central Park and for once our answer didn't seem way off the mark. It was quite fascinating to walk around an exceptionally maintained park and bump into 13th century monuments, a luxury most parks around the world don't offer. 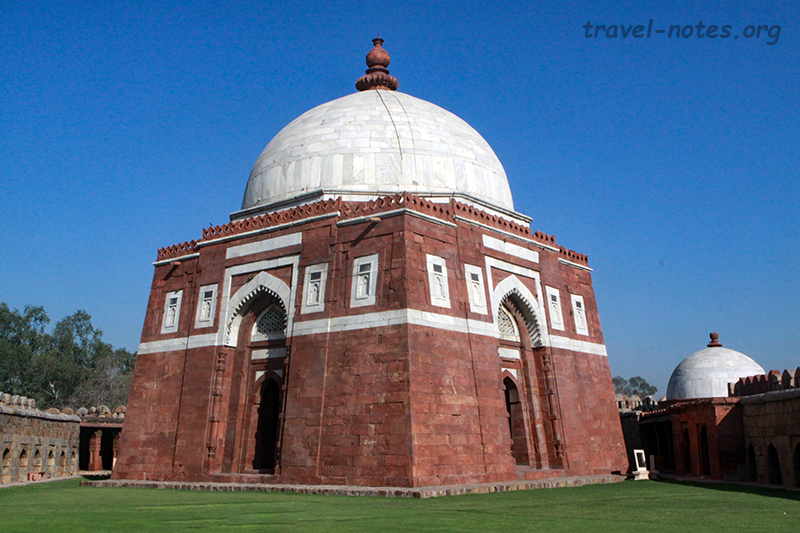 All the monuments were from the time of Delhi Sultanate, a period when five dynasties took charge of Delhi and the country changed hands faster than a teenager would change her mobile phone. 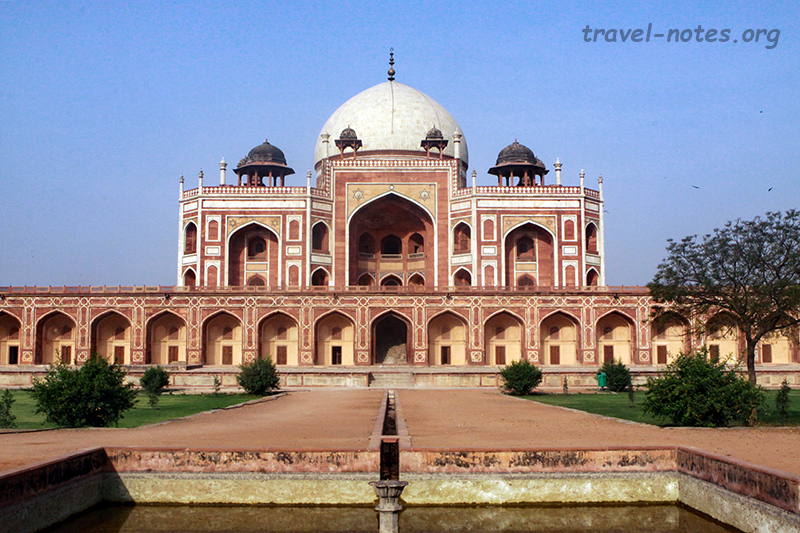 Close to one end of the park is the Safdarjung Tomb, the last credible building of any kind built by the Mughals. After a lightening stop at the city's famous Gurudwara Bangla Sahib and the nearby Jantar Mantar, a celestial observatory in stone built by Jai Singh II, the curtains were drawn on our morning sight seeing frenzy. In the evening, we somehow managed to inch our way to Jama Masjid, the largest mosque in India and the last architectural highlight of Shah Jahan's reign. For Rs. 20 (probably more for non-Indians), one can climb one of the minarets. Despite the fact that half of Delhi either seemed to be climbing up or down its steps, we managed to carry our 3 year old and the obsessively heavy Canon camera equipment up to the top of the minaret only to discover that the other half of Delhi has set shop at the top without any intention of making a move. In order to find a quite spot to feed our son, we stopped by the ruins of Firoz Shah Kotla on the way back from the Jama Masjid. The ruins is what is left of Firoz Shah Tughlaq's attempt to build a city here and it is quite amazing to find a sprawling enclosure devoid of humanity just a couple of miles down the road from what it seemed to be its hub. The ruins house one of the many pillars that Ashoka erected to etch his edicts and a ruined mosque which apparently so moved Nadir Shah that he took the artisans from here to build a mosque in his native Samarqand. Morning of Tuesday saw us heading off to Tughlaqabad - a ruined attempt of the founder of the Tughlaq dynasty Gyas-ud-din Tughlaq to build a city there. On one side of the road is the massive ruined fort and other side houses his well restored tomb. In the afternoon, we went to the quite modern looking Museum of Modern Art and spent the evening at the nearby India Gate. Qutub Minar, the 73m tall Afghan style tower filled our next morning at the monument routine. This is the first Islamic structure in India and at the foot of the world's tallest brick minaret is the nation's first mosque. 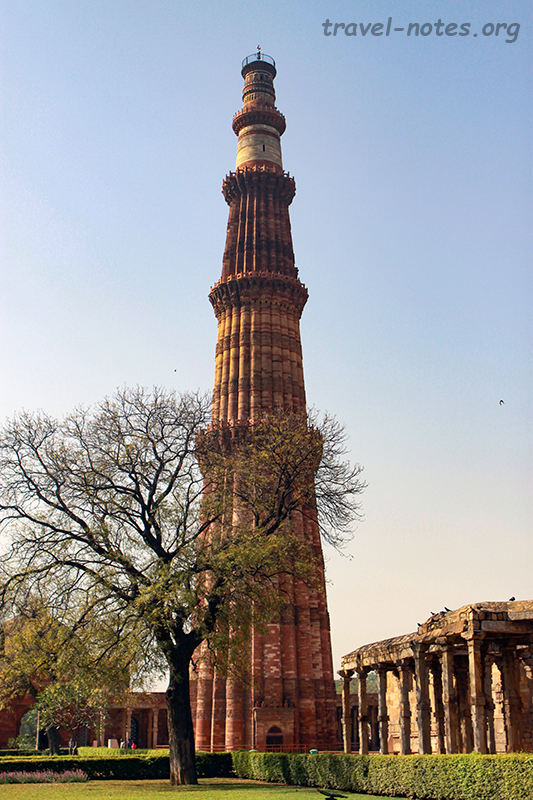 The tower was started by Qutub-ud-din Aibek, the first sultan of the first Delhi Sultanate and finished by his son-in-law, Shams-ud-din Iltutmish. The un-rustable, the 7m tall Iron Pillar from the Gupta era occupies a central location in the mosque. The site also houses the tomb of Iltutmish and the intricate Alai Minar - a failed attempt by Ala-ud-din Khilji to out-do the Qutub Minar and his more successful attempt to build a gateway to the mosque. On the way back from Qutub complex, we stopped at the Hauz Khas or the Royal Tank built by Ala-ud-din Khilji and the site later chosen by Firoz shah to build his simple tomb. In the early afternoon I made my way to the National Museum while my wife baby sat our sleeping son. National museum houses all the Indus Valley artefacts (including the famed Pashupati seals) that one can see in the Indian history books apart from some good collection of miniature paintings. In the evening all of us went to check out the Crafts Museum which was surprisingly good. It housed some exceptionally carved ivory and sandalwood pieces. We had run out of monuments by now and had to settle for religious structures for the following morning. 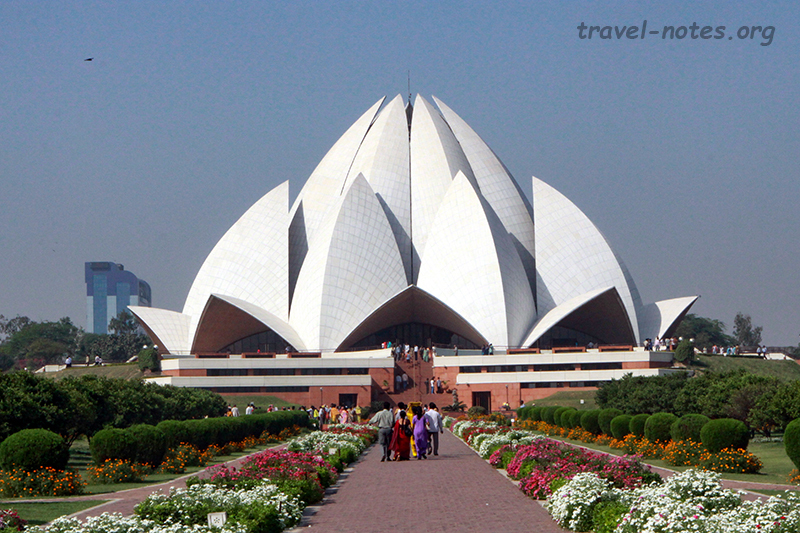 Birla Mandir and the more famous (and one of the great architectural masterpieces) Lotus Temple gladly filled the void. In the evening we checked out what turned out to be another gem, the International Dolls Museum. As the name suggests the museum houses dolls from various parts of the world and the collection is quite extensive and comprehensive. We finished of our final day by visiting Raj Ghat, the place where Mahatma Gandhi and Nehru family were cremated and the houses where they breathed their last. And thus ended our first successful trip in our new homeland and we want to sign off with a note about the cricket. Our week in Delhi coincided with the knockout stages of the Cricket World Cup 2011. Fact that the sport is followed like a shadow and everyone from the hotel waiter to the museum security chap could give us the current score came as no surprise to us. But we weren't expecting an in depth analysis of the relative effectiveness of Angelo Matthews and Jacob Oram's slower ball from one of our auto rickshaw drivers. This sure is a cricket crazy nation! Click here for more photos from Delhi.